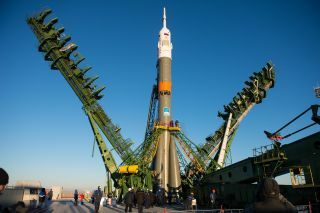 A Russian Soyuz rocket rolls out to its launch pad at Baikonur Cosmodrome in Kazakhstan ahead of the launch of three new members of the International Space Station's Expedition 42/43 crew. Liftoff is set for Nov. 23, 2014. A new three-person crew is launching to the International Space Station atop a Russian rocket today (Nov. 23), and you can watch the liftoff live online. NASA astronaut Terry Virts, European Space Agency astronaut Samantha Cristoforetti and cosmonaut Anton Shkaplerov are scheduled to launch to the space station aboard a Russian Soyuz spacecraft from the Baikonur Cosmodrome in Kazakhstan at 4:01 p.m. EST (2101 GMT) on Nov. 23. You can watch the launch live on Space.com starting at 3 p.m. EST (2000 GMT) via NASA TV. NASA astronaut Terry Virts (left), Russian cosmonaut Anton Shkaplerov and Italian astronaut Samantha Cristoforettie of the European Space Agency pose for a crew photo with their Soyuz spacecraft ahead of a Nov. 23, 2014 launch from Baikonur Cosmodrome, Kazakhstan. Today's launch will kick off Cristoforetti's first mission to space, but Virts and Shkaplerov have traveled to the space station before. Shkaplerov spent about six months on the outpost in 2012. Virts visited the space station for a two-week-mission in 2010 aboard NASA's Space Shuttle Endeavor. The three crewmembers will spend close to three months living and working on the orbiting outpost. "On a space shuttle flight, it was like we were going on a business trip," Virts told Space.com earlier in November. "It was two weeks. We hit the ground running from launch to landing. It was a sprint … We still hadn't learned how to live in space, how to move around in space, how to be efficient. We were still learning. On this trip, it's going to be six months. It's more like we're moving to space. It's going to be a different experience. I feel like I'm going to feel [what it's like] to be a space person as opposed to an Earthling." Virts, Shkaplerov and Cristoforetti's flight to the station will only take about six hours, but until 2013 it took much longer for crewmembers to reach the space laboratory. Before crew-carrying Soyuz spacecraft started flying these "express" trips to the space station, it would take about two days for spaceflyers to reach the lab. Once the three-person crew docks to the space station, they will bring it up to its full complement of six crewmembers. They will join NASA's Barry Wilmore and cosmonauts Alexander Samokutyaev and Elena Serova as part of the Expedition 42 crew. At the moment, Russia's Soyuz rockets and spacecraft provide the only way for U.S. astronauts to fly to the space station. In 2017, NASA officials hope to start using private space taxis developed by Boeing and SpaceX to ferry astronauts between the outpost and the United States.